19/11/15 -- Soycomplex: Beans closed with small gains. Weekly export inspections of 1.8 MMT were up 39 percent from the previous week and 23 percent from the prior 4-week average. China took virtually the lot. That easily beat trade estimates for sales of 700,000 MT to 1.1 MMT. Exports of 2,271,000 MT were still impressive even if they were down 9 percent from the previous week and 5 percent from the prior 4-week average. The primary destination was China (1,747,800 MT). Meal sales came in at 224,100 MT - in line with expectations. South Korea's MFG bought 60,000 MT of optional origin (thought most likely to be from Brazil) soy meal for June shipment. Argentina’s presidential election run-off takes place on Sunday, with opposition leader Macri expected to win, potentially lowering grain and soybean export taxes. MDA CropCast were unchanged on both their global and US 2015/16 soybean production forecasts from a week ago. They have this year's US crop at 3.9 billion bushels, and see production in Brazil at 99.9 MMT and in Argentina at 59.57 MMT. Jan 16 Soybeans settled at $8.60, up 2 1/4 cents; Mar 16 Soybeans settled at $8.63, up 2 1/4 cents; Dec 15 Soybean Meal settled at $286.60, up $1.00; Dec 15 Soybean Oil settled at 27.55, up 11 points. Corn: The corn market closed around a couple of cents higher. Weekly export sales of 779,800 MT for 2015/16 were a marketing-year high, being up 26 percent from the previous week and 46 percent from the prior 4-week average. They also beat expectations of 500,000 to 700,000 MT. Exports of 389,000 MT were up 44 percent from the previous week, but down 3 percent from the prior 4-week average. South Korea's KFA are tendering for 65,000 MT of optional origin corn for May shipment. There's talk of Chinese interest for US DDGs and sorghum. Israel bought 80,000 MT of optional origin corn (probably from the Black Sea) for Feb-April shipment. MDA CropCast were unchanged on the 2015 US corn crop at 13.78 billion bushels. They have Brazil at 79.6 MMT and Argentina at 25.4 MMT. They trimmed their EU-28 2015/16 corn production forecast to 55.2 MMT. Strategie Grains estimated 2015 EU corn crop at 57.3 MMT vs. previous estimate of 57.1 MMT. The Russian corn harvest is 87% complete at 12.2 MMT. The Ukraine corn harvest is 92% complete at almost 21 MMT. Dec 15 Corn settled at $3.64 1/4, up 2 1/2 cents; Mar 16 Corn settled at $3.70 1/4, up 2 cents. Wheat: The wheat market closed higher, aided for once by weekly export sales beating trade forecasts. These came in at 721,900 MT versus the anticipated range of only 200,000 to 400,000 MT. That was the best weekly total since the last week of July. Thailand (108,000 MT), Nigeria (103,100 MT), Taiwan (92,000 MT), Japan (90,600 MT) and the Philippines (79,800 MT) were featured buyers. Exports of 347,000 MT were up 45 percent from the previous week and 46 percent from the prior 4-week average too. One swallow doesn't make a summer though. Israel bought 30,000 MT of optional origin feed wheat (most likely from the Black Sea) for Feb-March shipment. Japan bought 114,491 MT of food wheat for Feb shipment in its regular weekly tender - split between US and Canadian origin. Strategie Grains estimated 2015 EU soft wheat production at 149.8 MMT versus a previous estimate of 149.5 MMT. The Ukraine Ag Ministry said that they had agreed with traders to limit wheat exports in 2015/16 to 16.6 MMT. Dec 15 CBOT Wheat settled at $4.90 3/4, up 7 1/2 cents; Dec 15 KCBT Wheat settled at $4.62 1/2, up 3 3/4 cents; Dec 15 MGEX Wheat settled at $5.08 3/4, up 8 3/4 cents. 19/11/15 -- EU grains closed mostly a touch higher. At the finish, Nov 15 London wheat was up GBP0.30/tonne at GBP111.85/tonne. In Paris, Dec 15 wheat was unchanged at EUR176.50/tonne, Jan 16 corn was up EUR1.50/tonne EUR168.25/tonne and Feb 16 rapeseed was EUR0.25/tonne higher to EUR376.00/tonne. Strategie Grains estimated the 2015 EU soft wheat crop at a record 149.8 MMT, up 300,000 MT from a previous estimate of 149.5 MMT. They also increased their export estimate for 2015/16 by similar volume to 26.8 MMT, although that's 17.5% below last season's record 32.5 MMT. They estimated 2015/16 EU soft wheat usage in feed at 54.5 MMT, down 1.5 MMT from a previous estimate of 56.0 MMT. This year's EU corn crop was pegged at 57.3 MMT versus a previous estimate of 57.1 MMT, and the EU barley crop was placed at 60.5 MMT, unchanged from their previous estimate. Looking ahead, and in common with others, the French analysts see soft wheat plantings for the 2016 harvest barley changed at 29.3 million ha - down just 1% year-on-year. "Soft wheat maintains a good acreage...because of the good conditions for wheat sowings, and poor conditions for rapeseed," they said. In other news, the Ukraine Ag Ministry said that they had agreed with traders to limit wheat exports in 2015/16 to 16.6 MMT. "The current size of the cap is unlikely to cause major concern as it is above both total season exports in recent years and current forecasts for 2015/16 exports," said the HGCA. Ukraine's wheat exports to the end of the first week of November were 7.96 MMT, according to their Ag Ministry. Ukraine's 2015 grain harvest now totals 58.7 MMT off 98% of the planned area, and should total 60 MMT at the finish, say the Ministry. The 2014 harvest was a record 63.8 MMT. Winter plantings in Ukraine are reported at 89% complete on 6.6 million ha. Wheat is said to be 91% sown and barley 82% done. Those figures don't include winter rapeseed, said to be still only 79% sown on 647k ha. The Russian grain harvest is said to be 98.9% done at 107.9 MMT in bunker weight. The corn harvest is 87% complete at 12.2 MMT. Russian winter plantings are said to now be done on 16.3 million ha, or 95.1% of the government's target. 18/11/15 -- Soycomplex: Beans closed lower, and within 2 cents of the the lowest close for a front month since Mar 2009. The trade perception is that plantings in Brazil are catching up, and that another record crop could be on the way from there early in 2016. If planting delays in Mato Grosso and other northern/central states do ultimately prove to be a problem, it could be more of an issue for safrinha corn planting than for full season beans it is being suggested. South Korea's MFG reportedly seek 60,000 MT of US, Chinese, or South American origin soymeal for June shipment. There's talk that China may start auctioning rapeseed oil from reserves this week. Some analysts have China’s November soybean imports as high as 7.2-8.0 MMT versus 5.53 MMT in October. Trade estimates for tomorrow's weekly export sale report for beans are 700,000 MT to 1.1 MMT and for meal 150,000 to 300,000 MT. Jan 16 Soybeans settled at $8.57 3/4, down 6 1/4 cents; Mar 16 Soybeans settled at $8.60 3/4, down 4 1/4 cents; Dec 15 Soybean Meal settled at $285.60, down $2.90; Dec 15 Soybean Oil settled at 27.44, down 3 points. Corn: The corn market settled around unchanged. Ideas that late soybean plantings in Central/northern Brazil night lean towards lower corn production down the line are a bit friendly. Colombia and Japan are both said to be seeking US corn for February shipment. CNGOIC estimated China’s 2015/16 corn surplus at 52.0 MMT versus a previous estimate of 55.0 MMT, but still up 1 MMT versus 2014/15. The French Farm Ministry estimated France's 2015 corn crop at 13.15 MMT versus a previous estimate of 13.1 MMT. Russia said that it's 2015 corn harvest was 86.9% complete at 12.2 MMT versus only 10.7 MMT this time a year ago. Trade estimates for tomorrow's weekly export sales report for corn are in the region of 500,000 to 700,000 MT. The US Energy Dept reported weekly ethanol production at 975,000 barrels per day, down 7,000 bpd on the previous week. The trade is forecasting/expecting an opposition Macri win in Argentina's weekend election run-off, which could open the doors for increased corn exports in the year(s) ahead. NYMEX crude manages to hold above $40/barrel for now. OPEC say that the average members' production cost is $43.29 per barrel - the lowest level in around six years. Dec 15 Corn settled at $3.61 3/4, down 1/4 cent; Mar 16 Corn settled at $3.68 1/4, up 1/4 cent. Wheat: The market closed lower. US exports remain poor. The trade is only expecting weekly sales of 200,000 to 400,000 MT tomorrow. Tunisia seeks 134,000 MT of optional origin soft wheat for Dec-Feb shipment, along with 92,000 MT of optional origin durum wheat for Feb-April shipment and 25,000 MTof optional origin feed barley for January shipment. Ethiopia are said to be likely to be back in the market tendering for wheat again soon. Jordan cancelled tender to buy 100,000 MT of optional origin wheat for Feb-March shipment. The French Farm Ministry estimated 2015 France soft wheat crop at a record 41.0 MMT, unchanged from their previous estimate. Russia said that they'd exported 18 MMT of wheat so far this calendar year. Australia is suddenly turning wetter. "Rainfall has increased sharply in Australia the past 2 weeks, following a very dry October. All the main wheat states have received beneficial heavy rainfall, 15% to 300% of normal this month to date. Soil moisture has gone from a deficit to a surplus in New South Wales' western wheat area where 48 millimeters of rainfall has accumulated in November. Similar drenching rains developed in South Australia and Western Australia, though Victoria has continued dry," said Martell Crop Projections. Dec 15 CBOT Wheat settled at $4.83 1/4, down 4 1/4 cents; Dec 15 KCBT Wheat settled at $4.58 3/4, down 4 1/2 cents; Dec 15 MGEX Wheat settled at $5.00, down 1 3/4 cents. 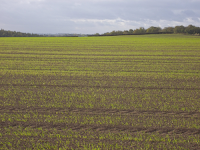 EU Grains Directionless - But Does New Crop Pricing Offer An Opportunity? 18/11/15 -- It was another quiet and relatively directionless day for the EU grains market. London wheat is managing to just about hold above GBP110.00/tonne, and Paris wheat doing likewise a touch better than EUR175.00/tonne. At the close, Nov 15 London wheat was down GBP0.05/tonne at GBP111.55/tonne, Dec 15 Paris wheat was up EUR1.25/tonne at EUR176.50/tonne, Jan 16 Paris corn was EUR0.75/tonne weaker at EUR166.75/tonne, whilst Feb 16 Paris rapeseed fell EUR0.75/tonne to EUR376.25/tonne. Forecast record world wheat, corn and soybean stocks at the end of 2015/16 hardly read bullish. The IGC will update us with their forecasts for these tomorrow, which might yet provide the market with another kick lower. The French Ministry estimate the 2015 wheat crop there at just under 41 MMT, a new record and 9% higher than that of a year ago, helped by better yields and increased plantings. The French barley crop is seen 6% higher at 12.43 MMT, but corn production will drop 27% to 13.39 MMT, they added. Russia's corn harvest is now said to be 86.9% complete at 12.2 MMT, with yields this year averaging 5.15 MT/ha versus 4.54 MT/ha a year ago. Russian winter planting works for the 2016 harvest are said to be finished on 16.3 million ha, slightly more than 95% of the anticipated Ag Ministry forecast and 400k ha less than had been planted this time a year ago. Nevertheless, a reasonably favourable weather outlook for the next couple of weeks means that the Ag Minister still sees final plantings reaching 17.1 million ha. Russia's grain exports so far this calendar year (Jan 1 - Nov 13) are 29.89 MMT, including 17.99 MMT of wheat. Marketing year grain exports (Jul 1 2015 to Jun 30 2016) are seen reaching 30 MMT. Exports might reach 35-40 MMT by 2020, according to the Russian Ag Minister. Israel are tendering for 80,000 MT of optional origin corn and 30,000 MT of optional origin feed wheat for Jan/Feb shipment. Jordan are in the market for 100,000 MT each of optional origin wheat and barley or Feb-Apr shipment. Nov 16 London wheat continues to offer a premium of around GBP14.00/tonne to the nearby old crop Nov 15 contract, and the far forward Nov 17 adds a further GBP7.00/tonne or so, for an overall additional GBP21/tonne extra compared to the current front month. Do these differentials provide something of an opportunity in a market that seems almost devoid of any if you are a UK cereal grower? One thing worth noting is that back on Jul 1, the first day of the 2015/16 marketing year, the premium on offer for Nov 16 was only GBP3.95/tonne. Nov 17 didn't trade until Jul 8 this year, but when it did that contract was only paying a GBP7.40/tonne premium to Nov 15. Both these differentials have therefore widened considerably in the last 4 months. In fact the Nov 15-Nov 16 spread is 350% (based on tonight's close) of what it was as recently as Jul 1, and the Nov 15-Nov 17 spread has increased to more than 280% of what was on offer on Jul 8. 17/11/15 -- Soycomplex: Beans closed with small gains, but not before Jan 16 had posted the lowest price for a front month since Mar 2009. Brazilian plantings are still a bit retarded, but catching up. Safras e Mercado said that as of Nov 13 Brazilian farmers had planted 56% of their 2015/16 soybean crop versus 42% a week ago and 68% on average at this time. Mato Grasso soybean planting progress was 83% complete, up from 60% done a week previously. Oil World said that an anticipated victory for opposition leader Macri in this weekend's Argentine presidential run-off could be more bearish for corn and wheat than beans. They think that this might herald a return to more traditional crop rotation in Argentina. Dr Cordonnier estimated the Brazilian 2015/16 soybean crop at 100.0 MMT and pegged Argentina's at 58 MMT, both unchanged from his previous estimates. Jan 16 Soybeans settled at $8.64, up 4 1/2 cents; Mar 16 Soybeans settled at $8.65, up 4 1/4 cents; Dec 15 Soybean Meal settled at $288.50, down $0.30; Dec 15 Soybean Oil settled at 27.47, up 18 points. Corn: The corn market closed with small gains. Bloomberg reported that Brazilian growers have a record large percentage of their new crop corn already forward sold, encouraged by the weak Brazilian real. Dr Cordonnier estimated the Brazilian corn crop at 81.2 MMT and sees Argentine production at 21.6 MMT, both unchanged from his previous estimates. Russia said that their 2015 corn harvest was 86.6% complete at 12.2 MMT. Israel tendered for 80,000 MT of optional origin corn for Jan/Feb shipment. Black Sea material is probably the favourite to win that business. Ukraine appear now to be concentrating their efforts on corn exports, although production this year has been hampered by dryness. Talk of reduced winter wheat, barley and rapeseed plantings and/or poor emergence issues in Ukraine could mean a sharp pick-up in spring plantings - at least some of which could be corn. We could therefore have a sharp rebound in production there in 2016. Crude oil is just about managing to keep its head above $40/barrel. OPEC are due to meet again in early December. Dec 15 Corn settled at $3.62, up 2 cents; Mar 16 Corn settled at $3.68, up 1 1/4 cents. Wheat: The wheat market closed lower across the three exchanges. A wetter outlook for US winter wheat areas was seen as bearish today. South Korea rejected all offers in a tender for 34,900 MT of US wheat for March-April shipment due to "high prices". Jordan tendered for 100,000 MT of optional origin wheat for Feb-March shipment and a similar volume of optional origin barley for April shipment. Jordan's 2015/16 wheat imports are projected at 1.2 MMT, similar to those of last season. Top supplier in 2014/15 was Romania (667 TMT), followed by Russia (416 TMT). Japan are in the market for 114,491 MT of food wheat for Feb shipment. French silo operator Socomac have reportedly joined Senalia and Nord Cereales in suspending the intake of wheat at their operations in Rouen and Dunkirk due to lack of export demand. These are the only approved delivery points against the Paris wheat futures contract. Beneficial moisture and mild temperatures are in the forecast for the Russian and Ukrainian winter wheat areas. The Russian Ag Minister says that winter plantings there should still ultimately match last year's levels. Dec 15 CBOT Wheat settled at $4.87 1/2, down 6 1/2 cents; Dec 15 KCBT Wheat settled at $4.63 1/4, down 4 1/4 cents; Dec 15 MGEX Wheat settled at $5.01 3/4, down 3 cents. 17/11/15 -- EU grains closed mixed. French markets traded mostly a bit higher following a renewed bout of euro weakness. At the close, Nov 15 London wheat was down GBP0.65/tonne at GBP111.60/tonne. In Paris, Dec 15 wheat fell EUR0.75/tonne lower to EUR175.25/tonne, Jan 16 corn was EUR0.25/tonne firmer at EUR167.50/tonne and Feb 16 rapeseed jumped EUR5.25/tonne to EUR377.00/tonne. The pound rose to 1.43 versus the single currency, and now seems to be setting its sights on a test of the 2015 high of 1.44 - a push above that would see the UK currency at its best level against the euro in more than 8 years. The euro also fell to around 1.0650 against the US dollar today, close to the 2015 low of around 1.05, which itself was a 12-year low. The outlook for further euro weakness in the months ahead is one of the few bullish straws that French wheat has to grasp at in the current market. It should certainly aid export demand going forward, but we've seen little hard evidence of this theory being turned into practise too much so far this season with EU soft wheat export licences currently down 31% year-on-year. News today that French silo operator Socomac had been forced to close their Rouen facility for the intake of wheat - following the lead of Senalia (and also Dunkirk-based Nord Cereales) last week - due to slack export demand, still leans bearish. The Ukraine Stats Office said that domestic grain stocks in commercial hands were up 60% as of Nov 1 at 31.7 MMT, including 14.4 MMT of wheat, 2.6 MMT of barley and 12.9 MMT of corn. Harvesting of the latter crop is now winding down and was 90% done as of yesterday. Live concerns remain about the prospects for Ukraine's 2016 winter-sown crops. 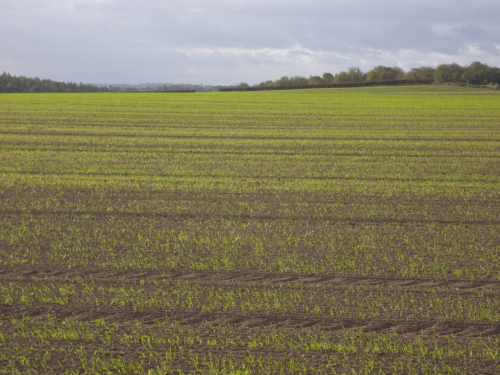 Winter wheat plantings are only 90% complete on 5.6 million ha, with barley sowings 82% done and the winter OSR area is only sown on 79% of the government's original forecast. UkrAgroConsult have cut their forecast for the 2016 Ukraine wheat crop from 19 MMT previously to only 17.5 MMT - that would be the lowest since 2012. Output this year was said to be 27.3 MMT by the State Stats Service, so if correct this would be a drop of nearly 36%. Separately, Agritel said that 36% of Ukraine's winter grain plantings have still yet to emerge due to earlier dryness and late sowings. Russia said that its 2015 total grain harvest was 98.9% complete at 107.8 MMT in bunker weight. The corn harvest is 86.6% finished at 12.2 MMT. The Russian Ag Minister said that the country would bring in a clean weight grain harvest in excess of 102 MMT this year versus 105.3 MMT a year ago. He forecasts total winter grain plantings for the 2016 harvest at 17.1 million ha, similar to a year ago, although only 16.3 million ha of that has been sown so far. At home, the HGCA said that the UK OSR area for the 2016 harvest would fall 14% to 565k ha - the lowest seeded area since 2009. 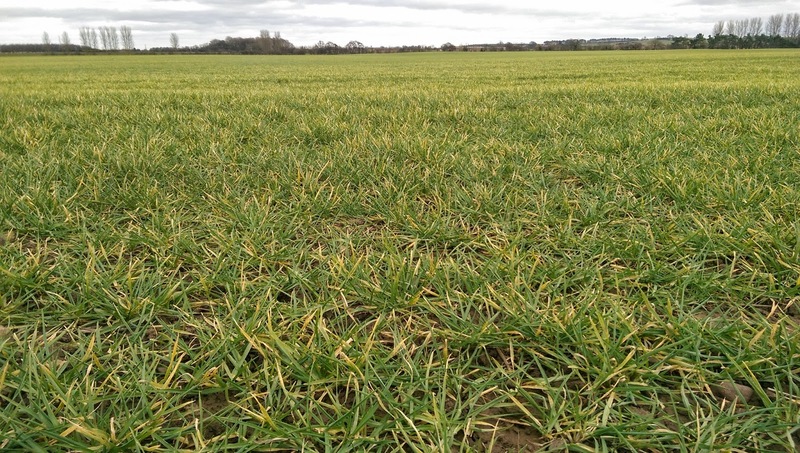 "The Early Bird Survey results are pointing to a static wheat area and the winter barley area is expected to decline marginally by 4%. The spring barley area, however, is anticipated to continue its growth and is expected 10% higher, year on year, at 727K ha," they said. The latter would mark the largest UK spring barley area since 2009 as the crop enjoys something of a renaissance. 16/11/15 -- Soycomplex: Beans closed modestly higher, supported by another strong weekly export inspections number of 2.161 MMT. Continuing with the robust demand theme, the USDA also announced 180,000 Mt of US beans sold to China for 2015/16 shipment under the daily reporting system. Also friendly was the NOPA soybean crush for the month of October hitting a record 158.9 million bu for the month, even if that was below the average trade estimate of around 161 million bu. "The weather last week in Brazil was more of the same - below normal rainfall in central and northeastern Brazil and too wet in far southern Brazil," said Dr Cordonnier. AgRural have plantings at 60% done nationally versus 63% a year ago and 71% on average at this time. The USDA didn't update us on US soybean harvest progress tonight, presumably asserting that the harvest is now finished. Jan 16 Soybeans settled at $8.59 1/2, up 4 1/4 cents; Mar 16 Soybeans settled at $8.60 3/4, up 4 1/2 cents; Dec 15 Soybean Meal settled at $288.80, unchanged; Dec 15 Soybean Oil settled at 27.29, up 25 points. Corn: The corn market closed with small gains. Support came from the USDA announcing 1.44 MMT of US corn sold to Mexico, split 952,500 MT for 2015/16 shipment and 487,680 MT for 2016/17 shipment. Weekly export inspections of 373,618 MT were modest as the firm US dollar continues to hamper foreign sales to all but traditional nearby homes like Mexico. Argentina look like they are now shaping up to be more aggressive on the corn export front pending the result of the weekend's presidential run-off and subsequent actions of the victor. After the close the USDA put the 2015 US corn harvest at 96% complete, up 3 points from a week ago and 2 ahead of the 5-year average. Ukraine said that their 2015 corn harvest is now 90% complete at 20.3 MMT off 3.7 million ha. The Ag Ministry forecast final Ukraine corn production at 24.5 MMT. Ukraine seaports exported over 1 MMT of grains last week, of which nearly 94% was corn (965 TMT). The Russian 2015 corn harvest is said to be now 86.6% complete at 12.2 MMT. Dec 15 Corn settled at $3.60, up 1 3/4 cents; Mar 16 Corn settled at $3.66 3/4, up 1 1/4 cents. 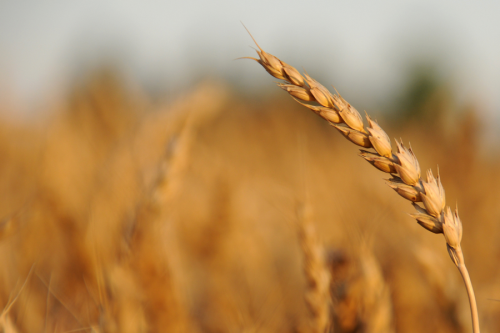 Wheat: The wheat market closed narrowly mixed. Weekly export inspections of a modest 279,013 MT were in line with recent lacklustre performances. Current marketing year to date inspections are now nearly 16% smaller than they were a year ago. South Korea's Daehan reportedly bought 24,900 MT of Canadian wheat for Feb shipment in a tender. The USDA reported the US winter wheat crop for the 2016 harvest at 94% complete, up only 2 points on a week ago and 4 points behind the norm. Emergence is 87% versus 80% a week ago and 86% on average. Good to excellent crop conditions improved 1 point on last week to 52%. but down from 60% a year ago. The Ukraine Stats Service said that their 2015 wheat harvest finished up at 27.3 MMT. UkrAgroConsult today apparently cut their forecast for production next year from 19 MMT to only 17.5 MMT due to adverse weather, delayed plantings and poor emergence levels. Reuters reported that 32% of the crop is in poor to very poor condition - the worst state in 6 years. Dec 15 CBOT Wheat settled at $4.94, down 1 3/4 cents; Dec 15 KCBT Wheat settled at $4.67 1/2, up 2 cents; Dec 15 MGEX Wheat settled at $5.04 3/4, up 1/2 cent. 16/11/15 -- EU grains closed mixed but slid mostly lower on the day. Fresh news was scarce, although concerns over Friday's late terrorist attacks in Paris seemed to cause some market unease and foster a bit more of a "risk-off" mentality. At the finish, Nov 15 London wheat was down GBP0.30/tonne at GBP112.25/tonne. In Paris, Dec 15 wheat was EUR1.00/tonne lower at EUR176.00/tonne, Jan 16 corn was up EUR1.25/tonne EUR167.25/tonne and Feb 16 rapeseed was down EUR0.75/tonne to EUR371.75/tonne. Ukraine said that their 2015 grain harvest was 97% complete at 58.2 MMT. The State Stats Service says that this includes 27.3 MMT of wheat and 8.6 MMT of barley. The corn harvest is now reported at 90% complete on 3.7 million ha for a crop of 20.3 MMT so far. The Ukraine Ag Ministry predict a final grain harvest of 59.5 MMT, including final corn production of 24.5 MMT. Total 2015/16 grain exports are forecast at a record 36.8 MMT. The Ministry say that final rapeseed production in the country this year was 1.77 MMT, and that the soybean and sunflower harvests are just about complete at 3.7 MMT and 10.95 MMT respectively. APK Inform reported that Ukraine seaports shipped out 1.027 MMT of grains last week, up from 715.2 TMT the previous week. Last week's exports included 305 TMT of wheat, 722.6 TMT of corn and 30 TMT of barley. Shipments of the latter now seem close to finished for the season. Ukraine's top export home last week was Egypt (183.7 TMT) followed by Spain (115.3 TMT). Russia's seaports weren't as busy as Ukraine's last week, shipping out 563.7 TMT of grains, down from 638.1 TMT the previous week. That included 472.4 TMT of wheat, 56.7 TMT of corn and 34.6 TMT of barley. Russia's Jul 1 - Nov 11 grain exports are down 9.5% year-on-year at 14.7 MMT, of which more than 76% (11.23 MMT) is wheat. The Russian 2015 corn harvest is said to be now 86.6% complete at 12.2 MMT. Russian winter grain plantings for the 2016 harvest are reported at more than 95% complete on 16.3 million ha (versus 16.7 million a year ago. Ukraine winter plantings are said to be 89% complete on 6.6 million ha, 1 million less than this time last year. The 15-day forecast for both countries is generally wetter and warmer than normal. 13/11/15 -- General: The markets continue to grind lower. The US corn and soybean harvests are in their last throes, and traditionally we should be looking for the market to put in a seasonal bottom around now. What's different about this year though is the general global economic malaise surrounding commodities - NYMEX crude closed within sight of $40/barrel tonight. There's also the unknown quantity that has opposition challenger Mauricio Macri as the new favourite to win the Argentine presidential run-off next weekend, turning agriculture in the country on it's head - if he wins and honours his pre-election promises that is. A recent article on Reuters said that Argentine grains output could grow by at least 30% by 2019 should this be the case. A win for Macri next Sunday could therefore add further downside to the grain markets at least in the short-term. The prospect for the US Fed to begin raising interest rates as early as next month is keeping the US dollar firm, adding further downside. The best hope of any upside potential still comes from winter grain losses in Russia and Ukraine, but these are many months yet from being easily quantifiable. Soycomplex: Beans closed lower, with the largest losses at the front-end. Weekly US export sales of 1,297,000 MT for 2015/16 were up 98 percent from the previous week, but still down 14 percent from the prior 4-week average. China 1,166,200 MT) as ever was the main taker. Actual exports themselves of 2,485,700 MT remain robust. The primary destination was again China (1,935,300 MT). AgRural estimated Brazil's soybean planting progress at 60% complete, up from 47% last week, but behind 71% on average at this time. IMEA said Mato Grosso’s soybean planting is 83.7% complete versus 60.7% complete a week ago and about unchanged from a year ago. The FSA estimated US soybean plantings at 81.277 million acres (including failed) versus their October estimate of 81.079 million. Informa estimated US 2016 soybean plantings at a hefty 85.3 million acres versus a previous estimate of 83.9 million. The NOPA October crush will be released on Monday. The average trade estimate for that is around 161 million bu versus just under 158 million a year previously. Nov 15 Soybeans settled at $8.59, down 10 1/4 cents; Jan 16 Soybeans settled at $8.55 1/4, down 7 3/4 cents; Dec 15 Soybean Meal settled at $288.80, down $2.60; Dec 15 Soybean Oil settled at 27.04, down 40 points. For the week that puts front month beans 12 1/4 cents lower, with meal down $6.90 and oil shedding exactly 100 points. Corn: The corn market settled around 3-4 cents lower. Declining crude oil prices are doing little to help corn's cause, and neither is the firm US dollar, weighing on exports. That said, weekly export sales of 618,600 MT for 2015/16 were not too bad, being up 11 percent from the previous week and 17 percent from the prior 4-week average. That was at the upper end of trade estimates of 450-650,000 MT. Actual exports of 270,900 MT though were down 45 percent from the previous week and 44 percent from the prior 4-week average. The FSA reported US 2015 corn plantings (including failed) at 85.033 million acres versus their October estimate of 84.811 million. Informa estimated US 2016 corn plantings at 90.1 million acres versus a previous estimate of 90.8 million. 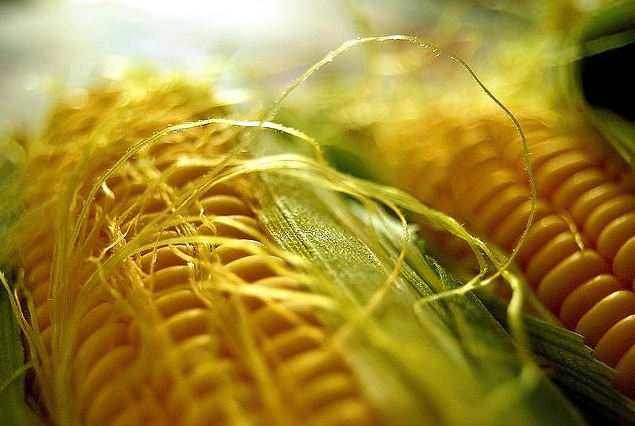 South Korea's KFA bought 60,000 MT of South American origin corn for April shipment. Ukraine said that its 2015 corn harvest was 89% done at 20.27 MMT. That suggests a final crop of 22.78 MMT, close to the USDA's revised estimate of 23 MMT. Russia's corn harvest is said to be 85.5% complete at 11.9 MMT. The French corn harvest was said to be 92% complete as of Monday, up from 86% a week previously and 4 points ahead of this time last year. Weekly CFTC data detailing the commitment of traders is delayed until Monday due to the Veterans Day holiday. Dec 15 Corn settled at $3.58 1/4, down 3 3/4 cents; Mar 16 Corn settled at $3.65 1/2, down 4 cents. For the week Dec 15 was down 14 3/4 cents and Mar 16 fell 16 1/4 cents. Wheat: The market closed mixed, but lower across the board for the week. Weekly export sales of only 226,670 MT for delivery in marketing year 2015/16 (despite being up noticeably from the previous week's paltry effort), were down 38 percent from the prior 4-week average. Exports of 239,300 MT were down 12 percent from the prior 4-week average. The firm US dollar and strong competition from the Black Sea and Europe among others continues to weigh on US exports. The FSA reported US wheat plantings for the 2015 harvest (including failed) at 52.673 million acres versus their October estimate of 52.507 million. Informa estimated the US winter wheat planted area for the 2016 harvest at 38.7 million acres. South Korea reportedly seek 59,800 MT of US or Canadian wheat for Feb-April shipment. Algeria were said to have bought 550,000 MT of optional origin milling wheat for January shipment, most probably French origin. Russia said that it's 2015 winter wheat harvest was 99.8% done at 63.9 MMT in bunker weight. The barley harvest is said to be 99.9% complete at 18.3 MMT. Winter grain plantings for the 2016 harvest are said to have now been completed on 16.2 million ha, or just under 95% of the original government forecast. A year ago at this time plantings were complete on 16.6 million ha. Dec 15 CBOT Wheat settled at $4.95 3/4, down 2 1/4 cents; Dec 15 KCBT Wheat settled at $4.65 1/2, up 1 3/4 cents; Dec 15 MGEX Wheat settled at $5.04 1/4, down 1 cent. For the week Chicago wheat was down 27 1/2 cents, Kansas lost 24 3/4 cents and Minneapolis slid 14 1/2 cents.